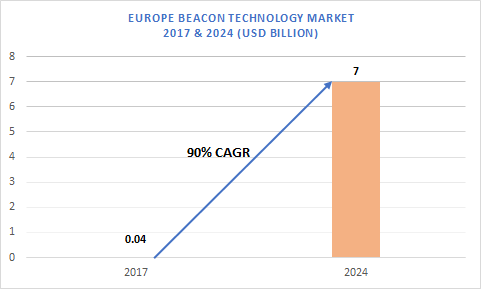 Europe Beacon Technology Market is estimated to be over USD 40 million in 2016 and is expected to register a lucrative growth between 2017 and 2024 with a CAGR of over 90%. This excellent growth is attributed to the factors including a widespread deployment of beacon technology in the application areas including transportation, tourism, healthcare, and retail stores. The penetration of indoor location technologies into smartphones is driving the interest of businesses, who are using beacons to drive new business endeavors through the creation of new service models. The improved internet infrastructure and the growth of smartphones will accelerate the adoption of the technology in the region. The retail sector is estimated to hold the largest market share of over 60% in 2024 on the account of the increasing use of beacon transmitters by the retailers to increase the customer revisits and enable impulsive purchases. The retailers deploy beacons to interact with customers by providing them useful information about the new products and the ongoing offers. These devices also provide interior mapping facility for the retail stores and enhance the guest experience by providing maps and sharing relevant schemes. As the consumer mobile devices continue to grow, the use of beacons in the retail industry will increase during the forecast timeline. In Europe, the UK held the largest market share in 2016 and is projected to dominate the market with a significant share of over 35% in 2024. The market is experiencing a speedy growth due to the growing number of beacons in various industrial sectors including hotels, retails, and transportation. For instance, the global entertainment company, FOX, used the Exterion Media’s beacon network on these buses in London in February 2016 for the promotion of the movie Kung Fu Panda 3. It partnered with Shazam to offer bespoke content on the mobile phones of commuters, which included the movie’s trailer. The rapid adoption of these devices by business organizations to strengthen their marketing strategies will fuel the market growth. As the technology is expanding, the retailers in the region are increasingly deploying beacons in their stores to offer a modernized shopping experience to the shoppers. For instance, in July 2014, the ‘Les Terrasses du Port’ shopping center in Marseille, France, installed a network of BLE beacons, allowing merchants to deliver targeted promotional offers to the customers on their mobile phones. This extensive beacon network installed in 480 hectares of the shopping center provided customers and retailers with a whole new shopping experience. The 250 Bluloc beacons were deployed by the German technology provider Match2blue. Some of the companies operating in the Europe beacon technology market include BlueCat, Hewlett-Packard Enterprises (Aruba Networks), Beaconinside GmbH, Estimote, Glimworm Beacons, MobStac, Quuppa OY, Relution, and Sensoro.